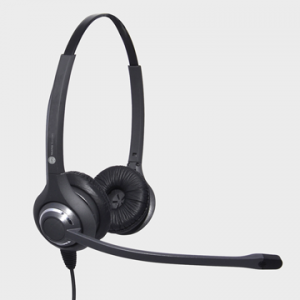 A professional office headset that offers both the single and dual ear capability with a call centre designed boom arm with improved microphone clarity and noise cancelling function. Left / right ear side compatible. Supplied with quick disconnect system(QD) – QD compatible with Plantronics. Ratchet style microphone boom arm. 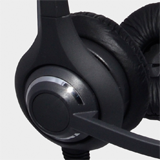 Mid-weight headset, ~ 62g / ~94g. Sure fit fully adjustable headband. Headset bag & hanging hook included. Compatible with all known office phones. Full range of bottom leads available. The bottom telephone connection lead is additional.